We all hear about the S&P500 in discussions related to the stock market. On CNBC, you might hear: “The S&P500 dropped 1% on X news…” – may from something related to oil, or the Fed, or some geopolitical concerns. When economists talk, they may reference the S&P as well in terms of the health of the U.S. economy. But what exactly is the S&P500? In prior articles and podcast, we’ve already talked about why we trade the S&P500, what is overnight trading risk, what is a credit spread, and more. In this article and podcast episode, we take a deeper look into what the S&P500 is and what it means for retail investors. The S&P500 is an index of 500 of the most widely held stocks in the stock market that trade on the NYSE and Nasdaq. How the S&P500 is fluctuating or performing, in large part, represents how the overall economy and investors’ psychological expectations of how the economy will be doing. So in some ways, it’s a leading economic indicator of the U.S. economy. Back in 1957, a company called Standard and Poor’s, created the index – on March 4, 1957. That company is still around today – in fact, they, along with Moody’s, were the ones who were responsible for improperly rating CDO’s that resulted in the financial crisis. If you didn’t see The Big Short Movie, we highly recommend that you go watch that! But back to the S&P500 – it’s an average of 500 of the most commonly held stocks in the U.S. (companies listed on the NYSE and NASDAQ exchanges). It’s market cap weighted — which means larger companies in the index such as Apple or GE have a larger impact on the index average than smaller companies such as Best Buy. The exact calculation also takes into consideration float – so it’s not just market cap weighted–there’s an adjustment based on how many outstanding shares are out in the float. Remember when we are talking about Coke/Pepsi – we’re talking about the entire umbrella organization -so almost every drink you can think of is likely a brand within Coke and Pepsi. PG&E (Pacific Gas & Electric) – your home heating bill..
As you can see, the S&P500 accounts for a wide diversity of the economy — everything from technology to basic materials, to healthcare and services. Because the S&P500 is market-cap-weighted with an adjustment for float (outstanding shares) – the larger a company is – the more of an impact it will have on the changes and fluctuations of the overall S&P500 index. So some of the larger names – including Wells Fargo, AAPL, Visa, Coke, Pepsi, GE — these companies will have larger impact than companies whose name you probably are not familiar with. 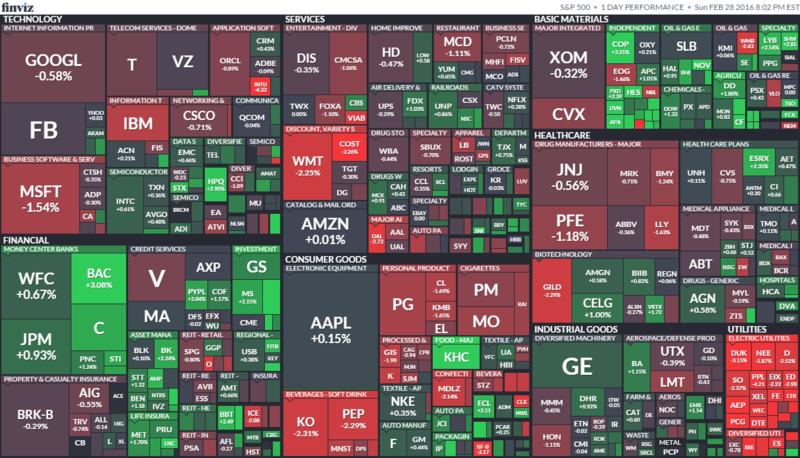 We have a nice graphic from Finviz that we are posting on our blog that illustrates the relative size of all the S&P500 components – so you can see how big GE is relative to other companies in the S&P500 — this is great example of data visualization and sector break down. You can find this on our site – or search what is the S&P500 lifestyle trading — and you should be able to find it on Google. See the complete list of companies in the S&P500. How are companies chosen to be in the S&P500? There’s actually a committee that gets together once a month to discuss any adjustments needed for the index based on fluctuations in the market, changes in fundamentals for any companies, mergers of any sort that may impact the company and overall index. market cap size (>$5.3B) and liquidity based on monthly trading volume. The committee meets once a month to discuss possible changes. When a stock is selected to be included in the S&P 500 or DJIA, its share price usually rises because many money managers buy the entire S&P 500 or DJIA index. Companies often want to be included for this reason. Companies chosen for the S&P tend to be leaders in their industry. As such, they are usually large caps, but not always. They exclude holding companies, which is why Berkshire Hatahway is not included. Over time, it is adjusted to account for changes in market cap, deterioration in fundamentals, share count, mergers and acquisitions, etc. Components are constantly changing. In the 10 year period from 2005-2015 – 188 index components were changed. The S&P500 is often used as a leading economic indicator of how well the U.S. economy is doing. If investors are confident in the economy, they will prop up the value of stocks. Back in 1957 – the S&P represented about 90% of the entire stock market, but since then there have been so many more stocks – and that percentage has gone towards 75%. Still, it’s a strong representation of the overall market sentiment. The SPY exchange-traded fund (SPY) is perhaps the most popular vehicle tracking the S&P that is accessible to professionals and retail investors a like. They are commonly referred to as “spiders” on wall street, named after Standard & Poor’s Depositary Receipts – (SPDR) – the full name of the security tracking the index. The SPDRs were first launched in 1993. An exchange traded fund acts just like a stock, except that it is actually an investment fund (portfolio of stocks) that tracks an underlying, which in this case is the S&P500 index. In the past, investors would actually put their money into mutual fund companies such as Vanguard, T. Rowe Price, and BlackRock, and incur various fees. Investors could only execute at the end fo the day and may be subject to minimum holding periods. But with the SPY exchange-traded fund, investors don’t face those hurdles As the name suggests, ETFs trade on exchanges, just as common stocks do. The other side of the trade is some other investor like you, not the fund manager. You can buy and sell at any point during a trading session at whatever the price is at the moment based on market conditions, not just at the end of the day, and there’s no minimum holding period. When mutual funds track indexes – they are actively managed. People manage those funds try to pick holdings to beat the index based on their judgment – resulting in expensive fees. Whereas, ETFs such as the SPY are tracked passively through the assembly of a portfolio that matches the index components as closely as possible. As a result, they have lower expenses than their index-tracking mutual fund counterparts. Banks love trading ETFs such as the SPY as they are one of the most liquid trading vehicles available in today’s market.For a trader, highly liquid trading vehicles means smaller slippage between the bid and ask. This is very important, particularly to algorithmic hedge funds that depend on this slippage to be as small as possible in order to max money with high frequency trading. Because the S&P itself doesn’t move as much as individual stocks do, those who would like leveraged forms of the S&P can look to UPRO (3x long the S&P) and SPXS (3x short the S&P). These ETFs seek to perform at 3x the performance of the underlying S&P index. These ETfs are available to both professionals and retail traders. Traders at banks also trade the VIX – which is the volatility of the S&P500, or how much the S&P500 is expected to move each day, regardless of direction. Also available are weekly options for the SPY ETF expiring every Friday as well as E-mini Futures (ES)that are leveraged trades that can be used for either speculation or hedging purposes. While E-mini Futures were designed to be a smaller portion size of the larger S&P Futures contract, the E-minis (ES) as a financial product are used both by big banks and the average retail investor like you and me. These are ETFs that let you get exposure to the 3 most popular stock market indexes with some leverage so you can actually enhance the % return. This means for every 1 % move in the index, you could get 2x or 3x of that 1% move — which means 2% or 3% moves — gives you more action in your account. However, note that the actual performance is slightly less than 2% and slightly less than 3% due to various fees –but more importantly, the inherent compounded daily returns nature of leveraged ETFs. That’s why they always warn you that leveraged ETFs are not meant for long term investors — only for short term trading. You can think of this leveraged decay similar to options decay but without the accentuated time decay towards the last 2 weeks prior to expiration. So those are some of the tickers you can type into any stock website like Yahoo FInance to see charts and get exposure to these 3 indexes — the S&P, Nasdaq, and Russell. So that’s what the S&P500 is — an index that represents roughly 75% of stocks listed on the NYSE and Nasdaq. There are elements of both human selection and rules that are used to determined which companies are in the index — there are 500 of them and the calculations are adjusted regularly based on market performance, etc. The index consists of all major sectors of our economy — everything from technology, to basic materials, to healthcare, services, utilities, and consumer goods. Because the S&P500 is an average, its daily fluctuations are usually 1% or less — compared with stocks, which often have wider swings. Traders who want more excitement or exposure may turn to leveraged ETFs or E-mini Futures. So now you know what the S&P500 is and can impress people around you about what exactly it is and what financial products are available to trade them. On a side-note – someone asked me what kind of trading-related interview question response they should have if someone asks them —what do you like to trade? If you answer with S&P500 – what should your response be? I’m interested in E-mini S&P futures (ES) because they’re one of the most efficient and economical ways of achieving leverage on a highly traded, liquid product. On a transaction basis, they’re often cheaper to execute than regular stock and they also provide you that leveraged exposure without the daily compound decay inherent in triple ETFs such as UPRO/SPXS. While leverage is a double-edged sword, when managing a portfolio of securities, the E-mini’s are an excellent way to hedge directional exposure when a trader does not have a directional view (delta-neutral). Find out more about why we trade the S&P500. To learn more about the S&P500 index, check out the Wiki page for it.